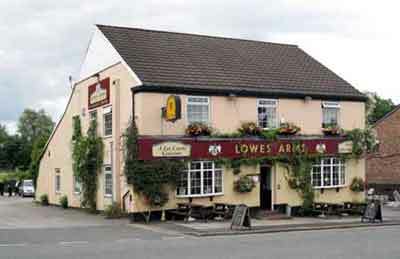 The Lowes Arms stands on the north side of Hyde Road, Haughton, just above Broomstair Bridge across the river Tame. When it was built it faced Old Broom Lane, which was the then the main road connecting Haughton with Hyde via a ford across the river. In 1818 the turnpike road between Manchester and Hyde was completed and this passed behind the house. Subsequently, the front and back of the house were reversed so that it stood on the turnpike (Hyde Road). On the 2 May 1823 an indenture was drawn up between John Lowe, George Gosling and Jonathan Gibbons for Gosling and Gibbons to lease the house but in the following year Charles Knott took over the lease. At this time the building was little more than a terraced house but with the coat of arms of the Lowe and Sidebotham families over the doorway. The Sidebotham family of Bowdon, Cheshire, were landowners in Haughton. Nearby, there were two coal pits. Broomstair Colliery was on the opposite side of Hyde Road to the house and Jet Amber Mine was on the same side in Jet Amber Fields, Farmers Fold, lying between the house and the river. As a result, miners frequented the Lowes Arms. It was recorded that beer was then 2d a pint and each miner would put half-a-crown (2s 6d) on the table. This meant that each miner could consume up to 15 pints of beer! Lowes Arms, Haughton, 14 July 2009. The Lowes Arms is well known for its in-house brewery and when George Henry Ashton was the publican in the early years of the 20th century beer and stout were brewed on the premises. The 1911 census records that George Henry was assisted in the family business by his wife, Sarah, and their two daughters, Ada and Ethel. 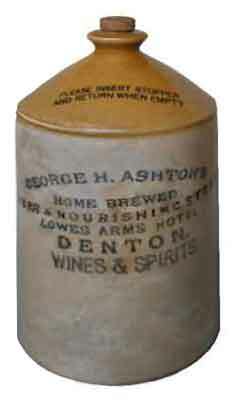 Stoneware beer flagon with lifting handle, internal screw top and ebonite stopper. By the time this flagon was made, the township of Haughton had become part of Denton. The potter's stamp is: JAMES PEARSON, BRAMPTON, CHESTERFIELD. This pottery can be traced back to 1810 when the Oldfield Pottery at Brampton, Chesterfield, was in operation. Thomas Oldfield, Catherine Johnson nee Pearson and two others were in partnership there, although there is evidence of a pottery on or close to the site in 1784. In 1826 the firm became known as Oldfield & Co but in 1884 it was taken over by James Pearson. In 1905 he died and the firm was then run by Dr Goodfellow on behalf of James Pearson's widow and family. The name was changed to James Pearson Ltd in 1907 and in 1922 it was absorbed into the Pearson business at Whittington to become Pearson & Co (Chesterfield) Ltd, whose address was: The Potteries, Whittington Moor, Chesterfield. This company also owned the Newbold Coal Mine. Although this firm closed in 1939, there were other potteries in the vicinity, the last one of which closed in 1994.